Eugène Lepoittevin (1806-1870) was born in Paris where he trained under Louis Hersent (1777-1860) and Auguste-Xavier Leprince (1799-1826). He was a prolific landscape painter and lithographer and exhibited regularly in the Salon in Paris from 1831. He travelled in England, the Netherlands, France and Italy. He borrowed from wide-ranging sources and mainly produced landscapes, history paintings and a famous Album de diableries. 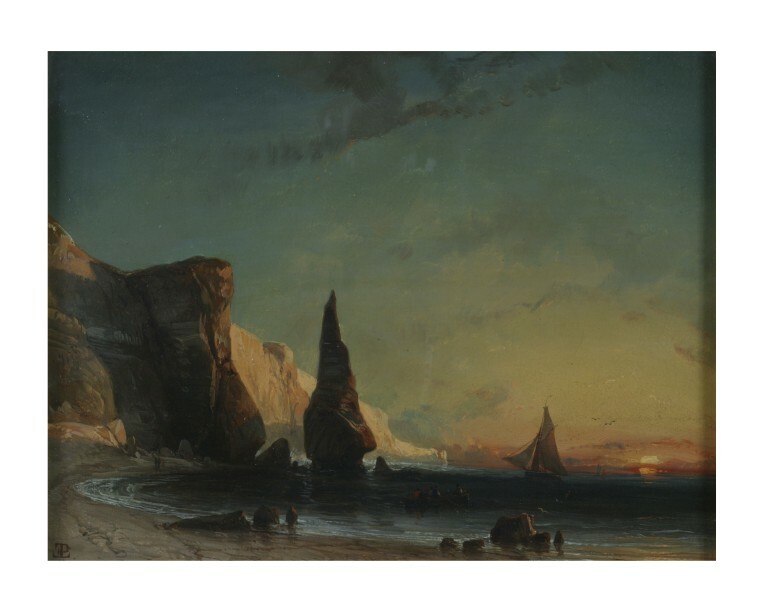 This painting is a fine example of Lepoittevin's seascapes executed during the 1830s probably after he travelled to the Netherlands. The composition relies in fact on earlier Dutch examples such as the paintings of Jan van Goyen (1596-1656). These earlier models were newly explored in the first half of the 19th century as they display a direct observation of the natural world in which the Romantics were interested in their opposition to academic art. A rocky coast at sunset with a sailing boat in the middle distance. Rev. Chauncey Hare Townshend, listed in the 1868 post-mortem register of the contents of his London house (V&A R/F MA/1/T1181) in the 'Fossil and Mineral Room. Front' (?) as 'An Oil on canvas. Rocky Coast-near Havre? By E. Poittevin. In Frame. Signed with Initials, French. Present Cent.y. H. 10 ¾ in., W. 1 ft. 2 in. '; Bequeathed by Rev. Chauncey Hare Townshend, 1868. Bequeathed by Rev. Chauncey Hare Townshend, 1868. Historical significance: This painting is a fine example of Lepoittevin's seaviews. 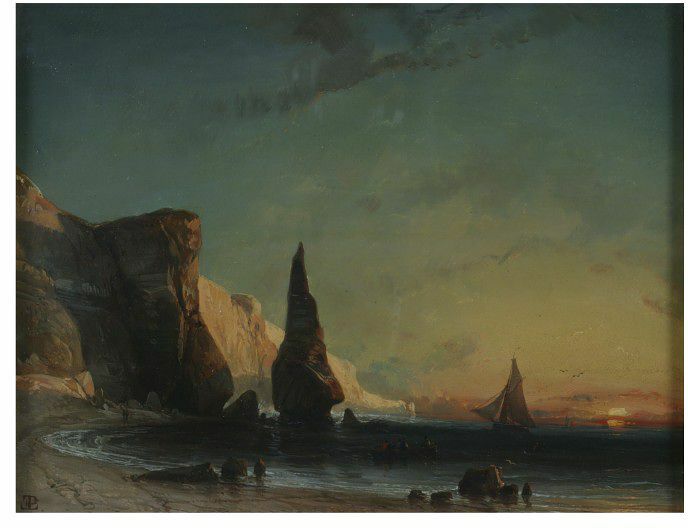 It depicts a rocky coast near Le Havre at sunset. The spacious, horizontal format and pictorial rendering of a diffuse sunset light is reminiscent of Dutch landscape paintings of the 17th century. Lepoittevin was particularly influenced by Dutch paintings in the 1830s, especially after he travelled to the Netherlands. The compositional formula is dominated by three pinnacles in the middle distance, bathed in the shade, set against the waning sunset light. These elements provide the picture with a sense of mystery, typical of the Romantic imagery. Comparable subjects by Lepoittevin include Fisherman waving at a boat from the shore, Port-en-Bessin, dated 1832, and A Family on the seashore, dated 1846, both in the Musée maritime de l'Ile Tatihou, Saint-Vaast-la-Hougue. 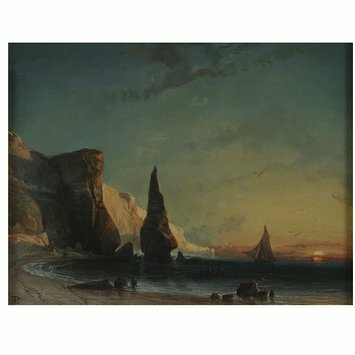 Lepoittevin is often compared with the Romantic painter Eugène Isabey (1803-1886) whose oeuvre includes similar compositions such as Boat at Moon Light, Musée National Magnin, Dijon. This painting was hung in the Fossil and Mineral Room in the Rev Townshend's house in London. Kauffmann, C.M. Catalogue of Foreign Paintings, II. 1800-1900 , London: Victoria and Albert Museum, 1973, p. 63, cat. no. 136. List of Objects in the Art Division, South Kensington Museum, acquired during the year 1869, London, 1870, p. 110.